Hello everyone I hope you are enjoying the cold weather and the cold front here in the United States! 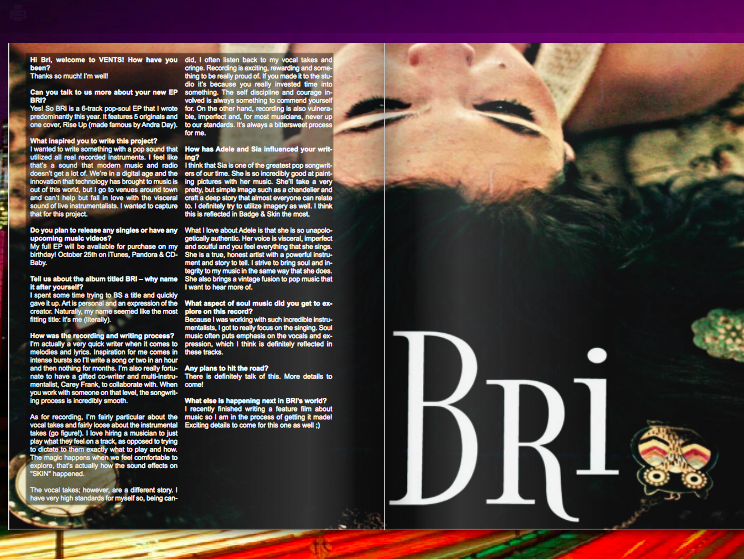 Today we have a new artist who goes by the name of Bri, A talented singer songwriter and actress based in Los Angeles. Influenced by music and performing arts at a young age, with a unique signature style that mixes jazz, blues, soul, and R&B. This is a beautiful young woman with a voice that can be compared to Adele and other mellow artist alike. Let’s dive into her newest releases! This song brings you back to church with a peaceful organ. It’s a different song due to it not being your typical song you’d hear anywhere else. I can see her singing this in a coffee shop, it fits the setting of the song perfectly. A little bit of jazz mixed in with pop. Skin is a song that grabs ya at first lyric. As I listen to the lyrics, I see a relationship being played out like a tv show. This is def one of those songs that should be submitted to a tv show due to it fitting the tone of a teen drama. Def worth a listen! This is an upbeat song that reminds me a little bit of Janis Joplin for some reason. I believe it’s the delivery of the vocals that brings that feeling to me. It has soul and jazz infused into one another. Def gonna be a classic in the indie world. This is a song that represents what I believe is going on in this world. It has an LGBT feeling to it and I really love it. A woman is singing to another woman and that is unheard of and I completely dig it. It’s about time that a song like this comes out. Def gonna a be a hit soon! There are more songs on her new release. Please check them out below and let us know what you think in the comment section. Thank you for checking this article out and be on the lookout for the new artist. Hi Bri, welcome to VENTS! How have you been? Thanks so much! I’m well! Can you talk to us more about your new EP BRI? Yes! So BRi is a 6-track pop-soul EP that I wrote predominantly this year. It features 5 originals and one cover, Rise Up (made famous by Andra Day). What inspired you to write this project? I wanted to write something with a pop sound that utilized all real recorded instruments. I feel like that’s a sound that modern music and radio doesn’t get a lot of. We’re in a digital age and the innovation that technology has brought to music is out of this world, but I go to venues around town and can’t help but fall in love with the visceral sound of live instrumentalists. I wanted to capture that for this project. Do you plan to release any singles or have any upcoming music videos? My full EP will be available for purchase on my birthday! October 25th on iTunes, Pandora & CDBaby. Tell us about the album titled BRI – why name it after yourself? I spent some time trying to BS a title and quickly gave it up. Art is personal and an expression of the creator. Naturally, my name seemed like the most fitting title: it’s me (literally). I’m actually a very quick writer when it comes to melodies and lyrics. Inspiration for me comes in intense bursts so I’ll write a song or two in an hour and then nothing for months. I’m also really fortunate to have a gifted co-writer and multi-instrumentalist, Carey Frank, to collaborate with. When you work with someone on that level, the songwriting process is incredibly smooth. As for recording, I’m fairly particular about the vocal takes and fairly loose about the instrumental takes (go figure!). I love hiring a musician to just play what they feel on a track, as opposed to trying to dictate to them exactly what to play and how. The magic happens when we feel comfortable to explore, that’s actually how the sound effects on "SKIN" happened. The vocal takes; however, are a different story. I have very high standards for myself so, being candid, I often listen back to my vocal takes and cringe. Recording is exciting, rewarding and something to be really proud of. If you made it to the studio it’s because you really invested time into something. The self discipline and courage involved is always something to commend yourself for. On the other hand, recording is also vulnerable, imperfect and, for most musicians, never up to our standards. It’s always a bittersweet process for me. How has Adele and Sia influenced your writing? I think that Sia is one of the greatest pop songwriters of our time. She is so incredibly good at painting pictures with her music. She’ll take a very pretty, but simple image such as a chandelier and craft a deep story that almost everyone can relate to. I definitely try to utilize imagery as well. I think this is reflected in Badge & Skin the most. What I love about Adele is that she is so unapologetically authentic. Her voice is visceral, imperfect and soulful and you feel everything that she sings. She is a true, honest artist with a powerful instrument and story to tell. I strive to bring soul and integrity to my music in the same way that she does. She also brings a vintage fusion to pop music that I want to hear more of. What aspect of soul music did you get to explore on this record? Because I was working with such incredible instrumentalists, I got to really focus on the singing. Soul music often puts emphasis on the vocals and expression, which I think is definitely reflected in these tracks. 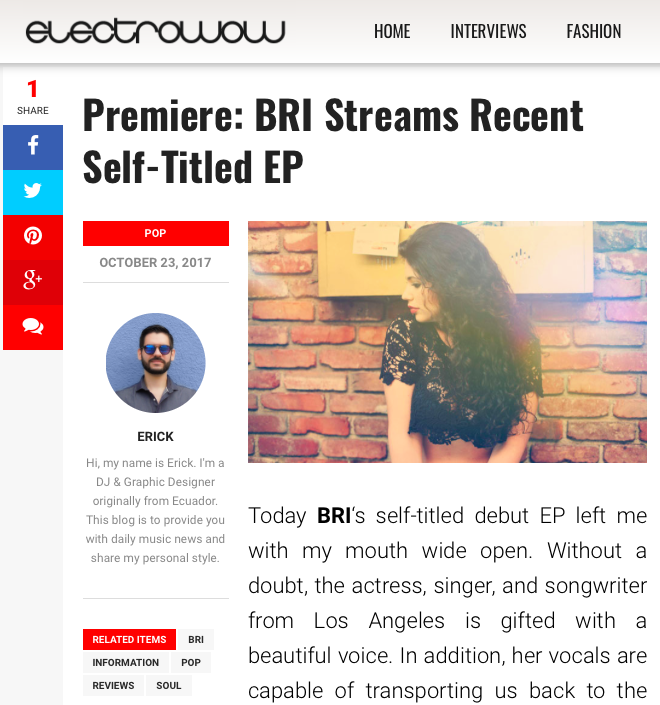 Los Angeles, CA - November 1, 2017 -- Up and coming singer/songwriter BRI releases her debut EP “BRI”. Featuring 6 fresh tracks that are the future of the sound of soul, BRI bares it all to reveal her depth as an artist. Poetic lyrics that convey universal emotions are delivered in BRI’s polished vocals. The band that backs BRI perfectly compliments the style and tone of the songs. The influences of artists like Idina Menzel, Amy Winehouse, Norah Jones, Adele, and Etta James are evident, but BRI puts her own unique spin on the genre. You can listen for yourself,“BRI” is now available on all major music platforms including iTunes, Amazon, Spotify and CD Baby. The 6 songs on singer/songwriter BRI’s new EP “BRI” offer listeners a modern take on soul music. BRI has been studying music since childhood, and it shows in her mature take on the genre. Backed by a four piece band, BRI’s vocals, a perfect mix of jazz, blues, soul, and R&B, shine. “BRI” is available on all major music platforms on October 25th. Today BRI‘s self-titled debut EP left me with my mouth wide open. Without a doubt, the actress, singer, and songwriter from Los Angeles is gifted with a beautiful voice. In addition, her vocals are capable of transporting us back to the lyrics’ narrative. This is due to the way she sings her heart out through all the six tunes. On the other hand, I believe is remarkable the influence of Soul music. However, there’s still a contemporary feel that goes hand-in-hand with the organic instrumentation. Likewise, this material reminded me of Adele and Amy Winehouse. Like them, BRI performs with unrestricted energy and great conviction. I don’t have any particular favorite track, but I’m loving her own interpretation of Andra Day’s “Rise Up”. Stream in full below and get your own conclusions.